Dimensions: 2.125" x 2.125" x 2.375"
Dimensions: 8" x 2.125" x 2.375"
Dimensions: 8.25" x 4.5" x 1.75"
American Retail Supply offers attractive ring displays. 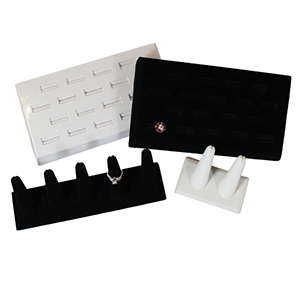 The materials used for ring displays is either faux leather or velvet, both are exceptional in quality and appearance. After knowing the materials in ring displays, we have colors in white or black. We recommend getting both colors as it will have a good contrast to ring with different colors. When displaying rings, we have options of how to store and display rings whether on the go or in store. We have 1, 2, or 5 finger ring displays which will fit any ring size. If that isn’t enough, we have 18 slot ring trays. Shop with American Retail supply who has been supplying Ring displays for jewelry stores for years. Call 800-4260-5708 if you have any questions.